You can never go wrong during the fall months with this dessert that includes apples and cinnamon. There is an abundance of apples at this time of year and as for the cinnamon… it fills your home with one of the most tantalizing aromas. We celebrated our new daughter-in-laws birthday this past weekend. When I asked her what she would like for her birthday dessert, she responded “chocolate”. This daughter-in-law is my kind of gal… another chocolate lover. I will be posting the chocolate recipe in the next few posts. But back to the apple dessert. I knew that not everyone would be thrilled with chocolate… you know who you are, so I found this wonderful apple torte dessert for you. 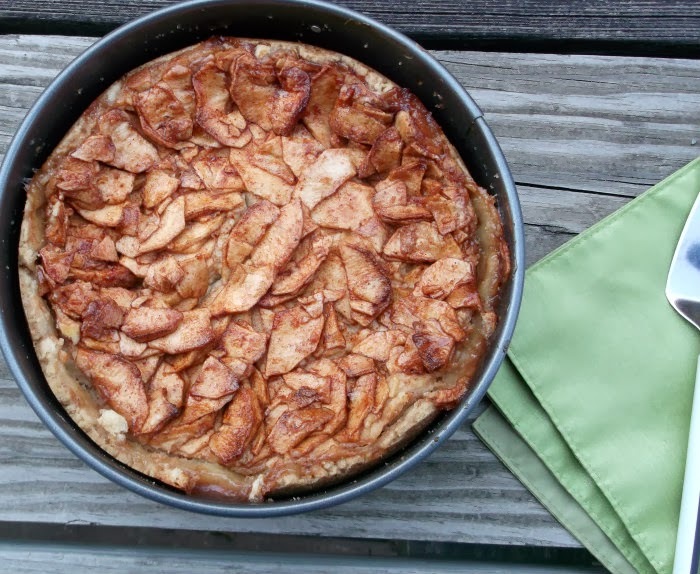 The only problem I had was that I had to use a bit smaller pan than what the recipe called for and I would say that it may have looked more like an apple cheesecake than a torte. But whatever you call it this dessert is yummy. From the buttery crust … to the cream cheese center… to the apple and cinnamon topping. Make this for non-chocolate lovers or for your chocolate lovers, I am sure that they will love it. 1. Combine the first ingredients. Press onto the bottom of an ungreased 9-inch (I used an 8-inch) springform pan. 2. In a bowl, beat cream cheese and sugar. Add the eggs, vanilla, and cinnamon; mix well. Pour over the crust. 3. Combine topping ingredient; arrange the apple combination over the filling. 4. Bake at 350 degree F for 55 – 65 (if using an 8-inch pan bake for an additional 5 to 7 minutes more) or until the center is set. 5. Cool on a wire rack. Store in the refrigerator. Cut into wedges with a serrated knife. Top with whipped cream. Note: Even a tight-fitting springform pan may leak. To prevent drips, place the pan on a baking sheet in the oven. Well, I do love chocolate but I also love apple desserts as well! So cool that this has a cheesecake like filling! The cream cheese center sounds so tempting – I needed a recipe for the 3rd weekend in November to take with me to a friend – this will be it! I’ll bake this allready this weekend to try the recipe … thank you Dawn! Wow! It looks beautiful and delicious. Oh, my gosh, does this sound amazing! 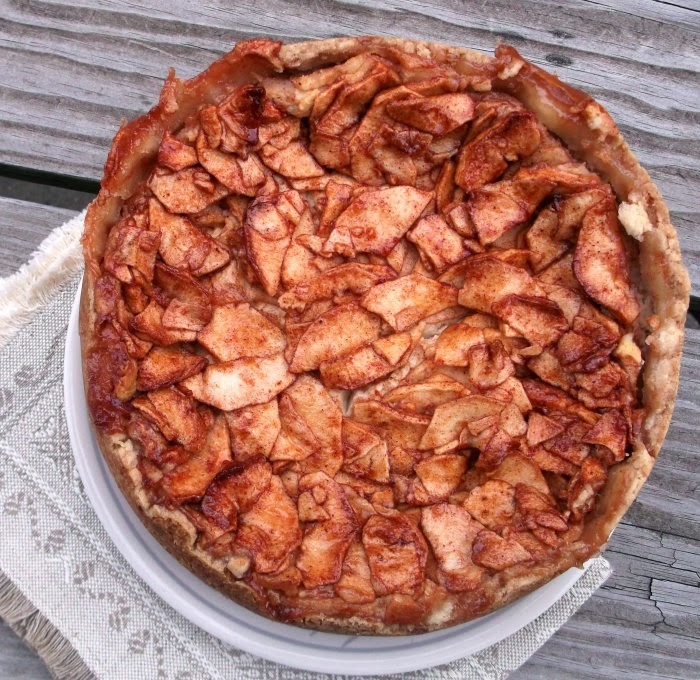 I’m a sucker for apple desserts…and I need to find an occasion to make this beauty!!! I’m a chocolate lover but I also can’t resist apple desserts, espectially this time of year when there are so many varieties available. I’ll probably make this with Braeburns. I’ll have a piece of this and the chocolate cake, please. 😉 This looks wonderful – thanks. 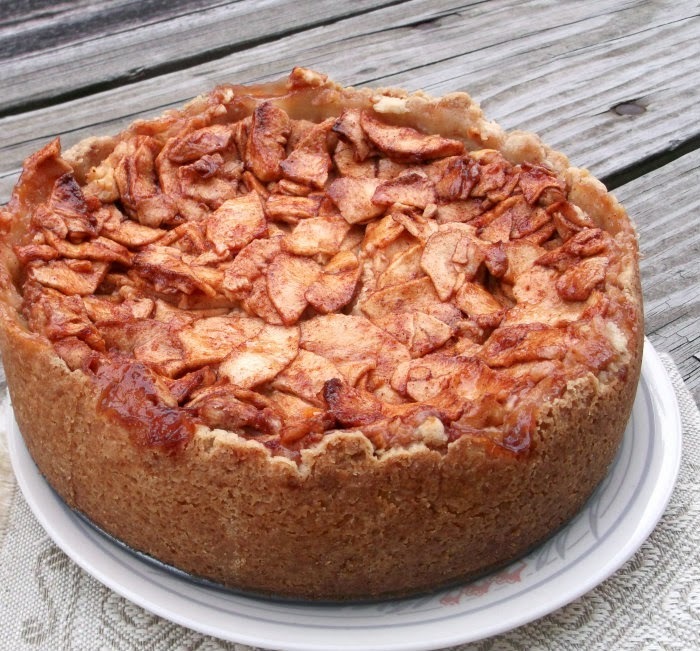 I baked this pie in the weekend – oh my – the best apple pie ever! My friend loved it as well, and I just shared the recipe to her … I’ll definitely take this pie with me next weekend! Thank you Dawn!